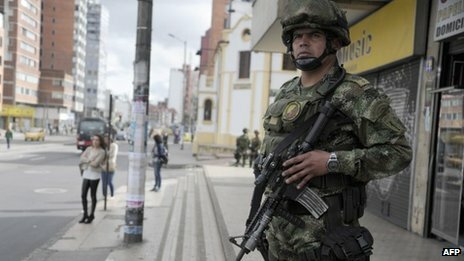 Colombia is deploying troops in the capital, Bogota, following violent protests in support of a strike by small-scale farmers. “Last night, I ordered the militarisation of Bogota and I will do the same today in any municipality or area that needs the presence of our soldiers,” President Santos said in a televised address after an overnight cabinet meeting. On Friday, the farmers’ leaders said they would no longer block highways but would retain roadside pickets. They said they would resume negotiations with the government on Saturday. President Santos also said he was deploying up to 50,000 troops on the nation’s road network to counter protests and blockages. He had earlier described the protests as “valid”, but urged demonstrators to keep them peaceful. Correspondents said masked youths threw stones and bricks, and fought riot police who responded with tear gas and water cannon. The protests have united potato growers and milk producers with teachers, health workers and students. Roadblocks set up by protesters have disrupted food supplies to major cities and towns. They say that free trade agreements with the European Union and the US, which have recently come into force, are flooding the market with agricultural products at prices they are unable to match.